Ferroalloys are used as master alloys in steel making, alloying of steels, for the production of stainless steels, and in iron or steel foundries. Ferroalloys are used in steel making for deoxidation as well as for the introduction of alloying elements. They are the most economical way for introducing alloying element into the steel. Ferroalloys impart distinctive qualities to steels and cast irons. The effect on the qualities of steels and cast irons largely depends more or less on the following influences. A change in the nature of the solidification, for example, upon inoculation. Ferroalloys are also added in steel production for grain size control as well as for improvement in the mechanical properties of steel. Depending upon the process of steelmaking and the type of steel being made, the requirement of different ferroalloys varies widely. The addition of ferroalloys to steel increases its resistance to corrosion and oxidation, improves its hardenability, tensile strength at high temperature, wear and abrasion resistance with added carbon and increases other desired properties in the steel such as creep strength etc. Ferroalloys are vital inputs for producing all types of steel. They are used as raw material in the production of alloys steel and stainless steel. Ferroalloys are usually classified into two main categories namely (i) bulk ferroalloys and (ii) noble or special ferroalloys. 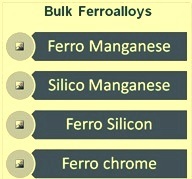 Bulk ferroalloys (Fig 1) are high carbon (HC) ferro manganese (Fe-Mn), medium carbon (MC) Fe -Mn, low carbon (LC) Fe -Mn, silico manganese (Si-Mn), MC Si- Mn, ferro silicon (Fe-Si), HC ferro chrome (Fe-Cr), charge chrome, MC Fe-Cr and LC Fe- Cr. Bulk ferroalloys are produced in large quantities in electric arc furnaces while the noble ferroalloys are produced in smaller quantities but are growing in importance. Bulk ferroalloys are used in steel making and steel or iron foundries exclusively, while the use of noble ferroalloys is far more varied. Fe – Mn is a bulk ferroalloy of great importance, mainly in the steel and stainless steel industries. Initially employed as a deoxidizing and desulphurizing agent, Fe-Mn is mostly being used today for improving the hardness and wear resistance of steels. Fe-Mn is produced as three types of products namely (i) HC Fe-Mn, (ii) MC Fe-Mn, and (iii) LC Fe-Mn. HC Fe-Mn has manganese in the range of 72 % to 82 %, carbon in the range of 6 % to 8 % and silicon in the range of around 1.5 %. MC Fe-Mn has manganese in the range of 74 % to 82 %, carbon in the range of 1 % to 3 % and silicon in the range of around 1.5 %. LC Fe-Mn has manganese in the range of 80 % to 85 %, carbon in the range of 0.1 % to 0.7 % and silicon in the range of 1 % to 2 %. HC Fe-Mn is produced by the carbothermic reduction of lumpy or sintered manganese ore in a three-phase submerged electric arc furnace (SAF). The commonly used electric arc furnaces are the closed, semi-closed and open types, which have either no or only limited consequences on the furnace itself, but does affect the gas composition, flow rate, recovery and dedusting system used. The diameter of the furnace varies from 2 m to 20 m. Smaller furnaces have the advantage of being more flexible, because they can switch over more easily between different products. The raw material is fed to the smelting process by gravity from storage bins above the furnace. The feeding tubes are placed around the electrodes in order to ensure an even distribution of raw materials to the furnace. For the production of HC Fe-Mn, the SAF differs from the furnaces that are normally used for the production of ferroalloys. Because of high vapour pressure of Fe-Mn, the smelting process needs a careful temperature control because the charge should not be overheated. The vapour pressure along with a relatively low resistivity of the Fe-Mn burden results in a low current density of the electrodes. As a result, the furnace need to be operated at a low voltage which requires a larger diameter of the electrodes for the high current that is needed for the process. SAFs for the production of Fe-Mn are operated only with self-baking electrodes. Because of the large diameter, the use of prebaked electrodes is uneconomical compared with the self baking electrodes. Self baking electrodes consist of a stiffened mild steel or stainless steel casing which is filled with a carbonaceous paste, consisting of a solid aggregate, usually calcined anthracite, and a binder of coal tar pitch. The tar becomes plastic when hot and fills the entire volume of the casing. On further heating of the electrode by the current and furnace heat, the paste is baked and becomes solid. The liquid alloy and the slag can be tapped off continuously or in regular intervals. The liquid alloy is cast into moulds lined with crushed Fe-Mn. A casting machine can also be used for casting the liquid alloy. The solidified alloy is then crushed and screened for the specific needs. Slag is normally obtained as rich slag (with about 30 % Mn) and is used further for the production of Si-Mn. There are some facilities where the CO rich off-gas is used to produce electricity. The CO rich gas can also be utilized for other industrial uses, for example as a raw material for chemical synthesis. For the production of MC Fe-Mn two different routes can be used. They are (i) the silico-thermic reduction of manganese ore, and (ii) the decarburization of HC Fe-Mn in an oxygen blown converter. The most important process is the decarburization of HC Fe-Mn, which is also known as the refining process of HC Fe-Mn. For the decarburization of HC Fe-Mn, oxygen is blown into the liquid alloy, which is tapped off from the furnace into a ladle. The oxygen blown into the liquid oxidizes part of the manganese and increases the bath temperature from about 1350 deg C to 1550 deg C. With increasing temperatures the carbon present in the HC Fe-Mn also tends to oxidize which again raises the temperature from 1550 deg C to 1750 deg C. The oxidization of carbon consequently reduces the carbon content of the Fe-Mn. For the production of MC Fe-Mn, the decarburization process ends when a corresponding carbon content of about 1 % to 3 % is reached. The high temperature also leads to the vaporization of Fe-Mn that leaves the process as fumes. The fumes can be collected by using hoods and further abatement by bag filter or electrostatic precipitators (ESP). In contrast to the refining process that uses HC Fe-Mn as a raw material, the silico-thermic production needs manganese ore and lime or a high grade slag and Si-Mn. The reduction itself is performed in a three-phase SAF, with electrodes made of graphite. At the end of the cycle, the molten alloy and the slag are cast and separated. The slag is recycled after cooling and crushing as a raw material in the production of Si-Mn. The fumes of the furnaces are dedusted in a bag filter. With the silico-thermic reduction, production of MC Fe-Mn containing less than 1 % carbon C is possible. The main advantages of the refining process are the lower operating temperatures and lower capital investment costs. LC Fe-Mn is traditionally produced by a silico-thermic process route. A rich slag is suitable as a raw material due to its low level of impurities. Also, the presence of already reduced manganese oxides in the rich slag is favourable for the process. The production of LC Fe-Mn in a SAF is very similar to the production of MC Fe-Mn by the silico-thermic process. Recent process developments have made the decarburization of HC Fe-Mn an economical and environmentally favourable processing route for the production of LC Fe-Mn. A carbon content of less than 0.5 % can be achieved, but usually 0.75 % is produced. Si-Mn is a preferred ferroalloy during steel making. It has emerged as a more important alloy than Fe-Mn. It is used as substitute for LC Fe-Mn. It is also required as a raw material to produce MC Fe-Mn and LC Fe-Mn. The standard grade contains manganese in the range of 62 -68 %, Si in the range of 12 % to 18 % and carbon in the range of around 2.0 %. The low carbon grade of Si- Mn has a carbon level of 0.1 % maximum. The production of Si-Mn is based on manganese ore or sinter and quartz as raw material. Instead of manganese ore, a rich Fe-Mn slag like that produced as rich slag in HC Fe-Mn, MC Fe-Mn and LC Fe-Mn production may be used as a manganese source. Si -Mn is produced in SAFs which can be closed, semi-closed or open types. The furnaces are the same or very similar to those used for HC Fe-Mn production and often a furnace is operated with alternate campaigns of each alloy. According to the composition of the feed mix, Si-Mn with a silicon content from 12 % to 35 % can be produced. For proper furnace operation and effective silicon reduction, it is necessary to penetrate the electrodes deeper into the burden in order to reach the high temperature needed for the process. Fe-Si contains 65 % to 90 % of silicon and minor amounts of iron, aluminum and carbon. Fe-Si increases the strength of steel and is therefore used in those steels which are required for producing wire cords for tyres and ball bearings. Fe-Si is also used for deoxidation during steel making. The other major applications of Fe-Si are in electrical steels used for transformers and dynamos, alloy steels for tools and automobile valves, and in iron castings. The raw materials that are commonly used for the production of Fe-Si are quartz, coke, coal, charcoal, wood chips, iron ore/steel scrap , and electrode paste. Around 1.75 to 2 tons quartzite is required to produce one ton of Fe-Si. A very high consumption of power (around 9 to 10 MWh) is needed to produce one ton of Fe-Si. In order to achieve good results, the selection of the raw material is to meet the strict quality requirements. The thermal strength of the quartzite is very important, since it is connected to the gas permeability of the charge where too much fine sized material may prevent gas flow. To avoid fines generation, excessive falls/drops and handling of the raw materials are to be avoided. The carbon quality is important for the environmental performance of the process, because the coal and coke contain sulphur and trace elements which can be emitted into the environment. The different raw materials that are used for the production of Fe-Si are preferably stored on hard surfaces in order to prevent contamination. The reducing agents are normally stored outdoor or indoors, the latter to avoid the material from humidity caused by rain. Some of the reducing agents can have self igniting characteristics. In these cases, appropriate methods have to be implemented to avoid self-combustion. Fe-Si are commonly produced in low shaft three phase SAFs. The electric furnace can be of the open or semi-closed type. The furnace normally rotates in order to connect the reaction areas around each electrode tip to break down crust in between the electrodes. The rotation gives rise to some difficulties in obtaining good capture efficiency of the diffuse emissions at the tap hole as the location of the tap hole rotates with the furnace. The raw material is fed from storage bins above the furnace, through feeding tubes. In small furnaces, the raw material can also be fed by using stocking cars. The open furnaces are commonly built up with moveable gates around the furnace hood to secure access for maintenance and possible manual feeding. The furnace fume hood is the upper part of the furnace. The hood has several tasks, first of all, it collects the process off-gas and shields the equipment from the process heat. Secondly, the hood is where the electrodes are placed and raw materials are charged. Hoods often include a cooling arrangement. For Fe-Si production, self baking electrode technology is used. The semi-closed furnace has been introduced to control the suction of air into the furnace top, thereby reducing the total gas stream from the furnace. This increases the gas temperature and requires an improved temperature control on the off gas side, but at the same time allows for an even higher energy recovery. The process off gas that contains silica fumes is cleaned in a bag house. The liquid alloy is tapped continuously or at regular intervals. The liquid alloy is cast from the ladle after the tapping is finished. Tapping ladles can be brought to the tapping position by suitable vehicles or by overhead cranes. The liquid alloy can also be directly tapped to the casting area without the use of the transport ladles. The Fe-Si is then cast into moulds and crushed by using jaw, rotary or roll crushers or granulated in water. In semi-closed furnaces, an energy recovery system can be implemented, although this highly depends upon the local parameters/circumstances (applicability). The production of Fe-Si is usually a slag free process, as nearly all the impurities present in the raw materials are transferred to the product. To obtain a higher purity Fe-Si, a further refining step is needed. The refining takes place by oxidizing the impurities in the ladle. Injection of oxygen or air is done through immersed lances, porous plugs in the ladle bottom or injectors. Correcting slag can also be added to improve the refining process. The refining stage is covered with a fume collection system consisting of a collection hood and a bag filter. Fe-Cr is an alloy of chromium and iron containing between 45 % and 70 % of chromium. It also contains varying amounts of iron, carbon and other alloying elements. Fe-Cr with chrome content below 56 % is known as ‘charge chrome’. Fe-Cr is the major alloying element in the production of stainless steel. The use of Fe-Cr depends widely on the carbon content. Fe-Cr can therefore be classified as (i) high carbon Fe-Cr (HC Fe-Cr) with 4 % to 12 % C, (ii) medium carbon Fe-Cr (MC Fe-Cr) with 0.5 % to 4 % C, and low carbon Fe-Cr (LC Fe-Cr) with 0.1 % to 0.5 % C.
HC Fe-Cr, produced from higher grade ore, is normally used in specialist applications such as engineering steels where a high Cr to Fe ratio and minimum levels of other elements such as sulphur, phosphorus and titanium are important. LC Fe-Cr is used during steel production to correct chrome percentages, without causing undesirable variations in the carbon or trace element percentages. It is also a low cost alternative to metallic chrome for uses in super alloys and other special melting applications. The main raw material to produce Fe-Cr is chromite ore, which is a mineral that contains iron and chromium oxides. The ratio between Cr and Fe in the chromite ore determines the chromium content of the alloy produced, e.g. a high Cr to Fe ratio is advantageous for the production of a ferroalloy with high chromium content. Chromite ores are used is in the form of hard or upgraded lump, friable lumps, or fines concentrate. The reducibility of different ores is quite different. Generally speaking for the production of Fe-Cr, podiform ores are of higher quality resulting in high Fe-Cr alloy, while stratiform ores have lower chromite content and a low Cr to Fe ratio resulting in charge chrome alloy. Podiform ores most often gives a chromium recovery in excess of 90 %, while fine stratiform ores have below 70 % recovery in conventional type production routes. With the DC plasma process, recovery is reportedly above 90 %. This compensates for higher consumption of electrical energy needed to increase the process temperature to achieve faster reduction. To convert ore fines and concentrates to a material that can be used in the furnace, they first need to be agglomerated by briquetting, pelletizing/sintering or sintering alone. Agglomeration is necessary to achieve good recoveries and also to give a permeable burden, which allows the gas from the reaction zone to escape. In this widely used technology of sintered pellets (grinding, pelletizing and sintering) the increased reduction rate of the fine stratiform ores is based on increased reaction surface, the recovery with pellets being close to 87 %. For podiform ores, the recovery benefits of these alternative process routes are not of the same magnitude. Depending on the different production routes and the desired carbon content of the Fe-Cr, carbon or silicon is used as a reducing agent. For the production of HC Fe-Cr, carbon is added to the process as a reducing agent in the form of metallurgical coke, coal or charcoal. Metallurgical coke is the most common reducing agent. It is important that coke with low phosphorus and sulphur contents is used because 60 % to 90 % of the phosphorus and 15 % to 35 % of the sulphur is transferred into the ferroalloy. For the production of LC Fe-Cr ferro-silico-chromium and ferro-silicon are used as reducing agents in a silico-thermic reduction. In case of coal, a washed coal is preferred to have improved reducibility. For some processes, primary raw material like coke or secondary raw material need to be dried before using them in the process. Coke drying is important to remove moisture. In order to achieve the right ferroalloy analysis, a good metal recovery and a satisfactory furnace operation, auxiliary materials such as quartzite, bauxite, corundum, lime and olivine can be added to the burden as fluxing agents. Around 2.5 tons chrome ore, with an estimated power consumption of 4.5 MWh is required to produce one ton of Fe-Cr. HC Fe-Cr is produced almost exclusively by the direct carbothermic reduction of chromite ore in three-phase SAFs with continuous operation. The burden can be preheated in a shaft furnace or rotary kiln by using the CO gas from the smelting process. Pre-reduction in a rotary kiln is also possible. In both cases, the specific consumption of electrical energy is reduced. Closed, semi-closed or open SAFs including three-phase AC operation and single phase DC plasma furnaces are used. The DC arc furnace includes a single hollow graphite electrode. The building of open furnaces for Fe-Cr production is prohibited in some countries because of environmental reasons. The formation of hexavalent chromium in the dust is very high in these furnaces. The SAFs use self baking electrodes. The electrode may be formed by hot paste, briquettes, blocks or paste cylinders. The electrode paste is charged on top of the electrode in accordance with its consumption. The material is subject to increased heat as it moves downwards in the electrode column. It melts at about 80 deg C and bakes at 500 deg C. To control the smelting process, the furnace operation can be based on resistance or current control, so that the electrodes are lifted and lowered when necessary to keep resistance or current constant. A system of electrode sealing is needed to prevent air leakage into the furnace. As an alternative, another practice which is commonly used is where the electrode moves only during slipping and otherwise stands in place. During the smelting process, the metal oxides are reduced by the coke, with metal carbides as the final product. The reduction produces large volumes of CO gas from the reaction zone under the electrode tips. In an open furnace, the CO gas is burnt at the surface of the furnace. Thus, the heating value of the CO rich gas is wasted. Compared with an open furnace, the off gas volume can be reduced in a closed sealed furnace by a factor of 50 to 75 and in a semi-closed furnace by a factor of 10 to 20. The cleaned CO gas can be used as fuel for raw material preheating, coke drying and similar processes. The heating value of the off-gas from semi-closed furnaces can be recovered in the form of process steam. Fe-Cr and slag are tapped off at regular intervals from tap holes near the bottom of the furnace. Slag and alloy are tapped through the same tap-hole by using cascade tapping into the same alloy ladle. The lower density slag floats to the top and eventually overflow through the ladle spout to the slag pot or via a secondary launder to a slag pit or granulating basin. Bed casting and layer casting are normal methods used for casting of Fe-Cr because of their simplicity and the low costs. The cooled castings are crushed and screened on the product handling line. The slag can either be granulated with a high pressure water jet or cast outdoors in layers, cooled, crushed and screened. MC Fe-Cr can be produced by the silico-thermic reduction of chromite ore and concentrates, or by the decarburization of HC Fe-Cr in an oxygen blown converter. The oxygen can be introduced in the liquid alloy either from the top by using water cooled lances or by injection from the bottom of the converter. The bottom blowing process has the advantage that a high decarburization rate can be achieved together with a high chromium recovery. The high bath temperature in a bottom blown converter affects the high decarburization and chromium recovery rate. The silico-thermic route is more economical and therefore more important for producing MC Fe-Cr. The reason may be the small amount of MC Fe-Cr that is needed compared with the high demand of HC Fe-Cr together with the fact that LC Fe-Cr can also be produced by the same process as well. In the case of LC Fe-Cr in order to get the desired low carbon content, a carbothermic process cannot be used. The commonly used processes are therefore metallothermic reductions known as the Duplex, Perrin, and Simplex processes. Duplex process is more popular. In this process, LC Fe-Cr is produced by the silico-thermic reduction of a lime chromite slag. The slag smelting process takes place in a tiltable AC arc furnace with self baking electrodes. The furnace is operated at about 1750 deg C. The liquid alloy is tapped in regular intervals into a first reaction ladle. When Si-Cr, ore and lime are added to the ladle, the reacting mixture is converted into LC Fe-Cr and an intermediate slag. During this process the ladle is covered by a fume hood. About 70 % of the intermediate slag is transferred to a second reaction ladle, which is also covered by a fume collection hood. Adding Si, Fe-Si, sand and boric acid to the mixture produces a final slag and the alloy. The alloy is recycled back to the first ladle. A bag filter cleans the off-gas of the furnace from both reaction ladles. The dust from the bag house is recycled into the smelting furnace. The Perrin process is similar but uses two arc furnaces. LC Fe-Cr can also be produced by the Simplex process. In the Simplex process HC Fe-Cr is crushed in a ball mill in order to get a ferro-alloy powder. After briquetting, the HC Fe-Cr powder together with Cr2O3 and Fe2O3, the mixture is decarburized by annealing at about 1350 deg C in a vacuum furnace.